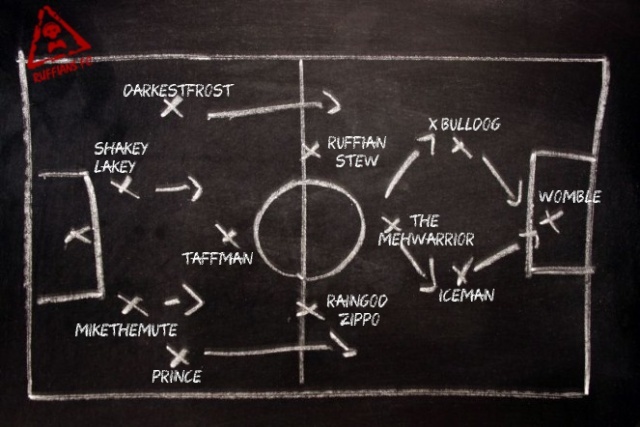 As you know over the past few weeks myself and El Capitano (Ruffian Stew) have been trying out a few methods to improve the Ruffians FC experience for everyone involved. This week we are going to try something similar to something we have done in the past. As a club we are getting quite full and our fixture nights have been particularly busy recently (which is great to see). However we have noticed that people aren't using the sign up posts and tend to just turn up. Whilst this is OK when we only have a few players on, now we are getting busy I'd hate to turn people away! To encourage people to sign up we will be trying a new system whereas when you sign up you pick your position for the fixture night. It goes without saying that the sooner you sign up the more positions will be available. For the players that don't sign up, they will have to play in the available positions and if there is no space then unfortunately they won't be able to take part. What we want to try and avoid also is players who sign up regularly moving round to accommodate those that don't sign up as I don't feel this is fair. I'll take a CDM Position and I will put your position next to your name on the list below! I will also cross them off the list as they get taken! My vote goes to Rotherham Utd!!! I'll take CDM as well! And my vote goes to Crawley Town. Afraid I'm going to have to drop to a maybe so if I get on I will play wherever is free and someone else can have the LW position. I'm in. I'll take forward, midfield, defence or goalkeeper. Darkestfrost wrote: I'm in. I'll take forward, midfield, defence or goalkeeper. That's the idea behind the post. Everyone get's the same XBL message when I've done the post so if they want 'their' position then they have to sign up ASAP. It's to encourage those that don't sign up and assume they get 'their' position when they come on to actually get involved with the forum etc. Most weeks we have players moving round to accommodate those that don't sign up and I don't feel that is fair to the people that sign up regularly. We are just trying out a number of different ideas to make the nights fairer to all involved.